BRISTOL - With a Connecticut Twilight League Championship on the line, the Brickhouse Indians (Newington) turned to Griffin Bremmer and he delivered a big-time performance against the Chicago Sam’s Orioles. Bremmer ended the game the way he had been pitching all night, flashing dominant strikeout stuff. He had two strikeouts in the final inning and nine total in a complete game in a 9-3 win Friday night at Muzzy Field. The win was the second championship in total for the Indians, the first coming back in 2006 under previous manager Chris Barsa. 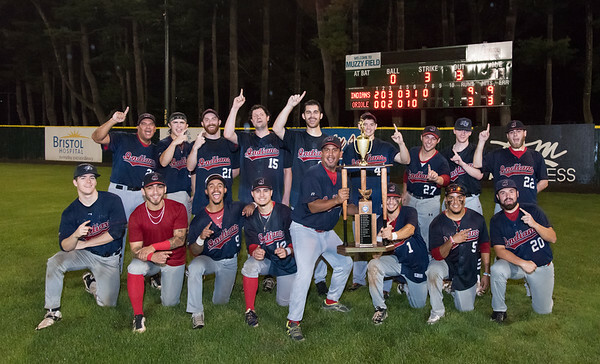 But current manager Keith Echevarria didn’t have to wait long at all for his first title. Eric Jaillet started things offensively in the top of the first inning with a RBI double off of Orioles starting pitcher Caleb LaRosa. It was part of a nine-hit offensive outburst in the game. In the bottom of the second inning Bremmer faced one of the few jams he’d face in the game with runners on second and third and two outs. Bremmer got out of it with a strikeout to end the inning. While the fastball velocity was there all night, Bremmer also featured off-speed pitches, limiting the Orioles to five total hits. Camden Mamigonian had a sacrifice fly in the third inning to drive in the third run. Trent Dillon came into score as well on a throwing error. Later in the inning, Mike Lord ripped a RBI single to give Brickhouse a 5-0 lead going into the bottom of the third inning. Chicago Sam’s only scoring came in the bottom of the third inning on a two-RBI single by Adam Camilleri. Mamigonian added a double to drive in two runs in the top of the fifth inning, giving Brickhouse a five-run cushion. Lord drove in a run later in the inning to make it 8-2. With Bremmer dealing, the lead was too much for the Orioles to overcome. Posted in New Britain Herald, Newington on Friday, 17 August 2018 21:13. Updated: Friday, 17 August 2018 21:16.